Allterrain Services Kenya Limited was incorporated in 1998 and started training in 2013 with its first camp management contract in Lokichar, Turkana district under Marriott drilling Company Limited who drilled for Tullow Operations. This was the flagship project for ATS and soon after ATS went on to start various camps for SMP drilling and Tullow Kenya Limited. The success of ATS Kenya was mainly due to a good understanding of the local community dynamics and an excellent staff who were trained on ATS standards and were quick to learn. This resulted in a happy clientele all through the projects. In 2014, ATS acquired a small cleaning business and begun offering cleaning services to a few clients, namely PKF East Africa Ltd, Text Book Centre, Relief International and others. 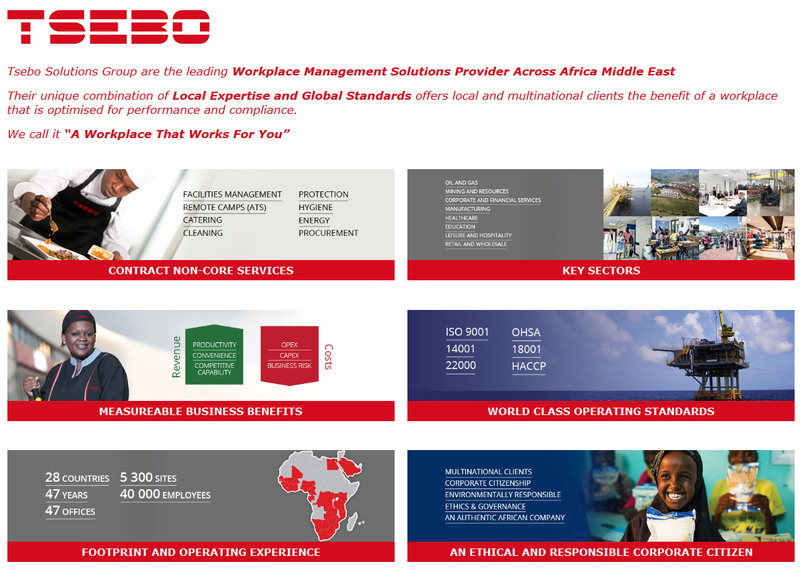 Over the years, this sector of the business has grown and in 2016 ATS has launched a full facilities management offering under its Tsebo facilities solutions brand. The Tsebo facilities solutions brand (TFS) will be responsible for rolling out the full facilities solutions suite of products while the ATS brand will remain for camp management solutions. ATS Kenya continues its march to be the dominant player in both the facilities solutions and the camp management services sector in Kenya.